Johns Hopkins computer scientist Russell H. Taylor’s groundbreaking work in medical robotics has earned him the prestigious 2015 Honda Prize. The Honda Foundation, based in Tokyo, was established by Honda Motor’s founder Soichiro Honda and his younger brother, Benjiro Honda. The foundation is currently headed by Hirito Ishida. 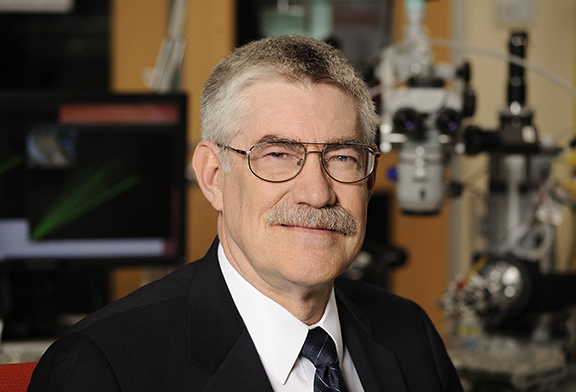 Taylor was chosen as the 36th recipient of the Honda Prize for his crucial role in the early development of medical robotics technology, for his mentoring of students and other researchers in the field, and for his continuing contributions as a leader in this science and technology area. The prize will be presented at a ceremony in Tokyo on Nov. 17. Along with the prize medal and a diploma, the newest laureate will be awarded 10 million yen (approximately $83,000). More than four decades ago, Taylor launched his robotics research. He began focusing on medical robotics over 25 years ago, at a time when the field was virtually nonexistent. The Honda Prize recognizes this early work as well as his continuing role as a global leader in efforts to enhance medical treatment through the expanded use of robotic devices and computer-integrated tools. Taylor has always emphasized that his goal is not to produce technology that would replace physicians but to give doctors new tools that can help them achieve better outcomes in treating their patients. Taylor has long-standing ties to Johns Hopkins University dating back to his undergraduate education. He earned his bachelor of engineering science degree at the school in 1970 before moving on to Stanford University, where he obtained a PhD in computer science in 1976. In the same year, he joined the IBM T. J. Watson Research Center, where he worked until 1995 as a research staff member and later a research manager. At IBM he developed the AML robot language and managed the Automation Technology Department and later the Computer-Assisted Surgery Group. While at IBM, Taylor was the primary designer of a prototype hip replacement surgical assistant dubbed ROBODOC, which is considered the world’s first surgical assistant robot for a major surgical procedure. This system was commercialized for use on humans by a startup company, Integrated Surgical Systems. Many of the concepts first developed for ROBODOC were later incorporated into robotic devices used for other surgical applications. During his tenure at IBM, Taylor also developed the Laparoscopic Assistant Robotic System, which constantly displays the surgical field at the center of a screen that can be monitored by the operator during laparoscopic surgery. This system improved this type of medical procedure by attaching a joystick to the surgical instrument to enable the surgeon to manipulate the endoscope without the help of an assistant. During development of this system, mechanical safety was enhanced via the Remote Center of Motion mechanism. This safety advance is also employed in da Vinci computer-assisted surgical systems that are now in use worldwide. In 1995, Taylor joined the Johns Hopkins University faculty as a professor of computer science, with joint appointments in radiology, mechanical engineering and surgery. In 2011 he was named the university’s first John C. Malone Professor. Taylor’s current research focuses on robotics, human-machine cooperative systems, medical imaging and modeling, and computer-integrated interventional systems. At Johns Hopkins, he directs the university’s Engineering Research Center for Computer-Integrated Surgical Systems and Technology and its Laboratory for Computational Sensing and Robotics. Taylor has authored more than 400 peer-reviewed publications and book chapters and has been honored by numerous professional societies representing engineering and medical specialties. Color photos available; contact Phil Sneiderman.